When you walk into a library it can be overwhelming. Even the Children's Section is often overflowing with books for kids of all ages. While the easiest option is always to look for the librarian and ask for some suggestions, I'll be honest, it is not always possible. So the question remains, how do you find a fun book to read to your kids in the stacks and stacks of options? For today though, let's check out a fun classic that was read on Reading Rainbow back in the day: Caps for Sale. 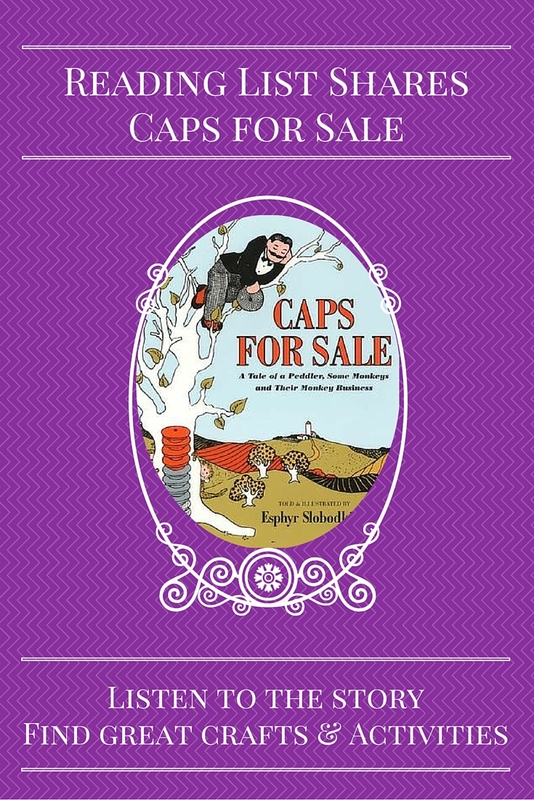 Caps for Sale: A Tale of a Peddler, Some Monkeys and Their Monkey Business ** by Esphyr Slabodkina is a wonderful story that followers a peddler as he walks through town selling his caps. On this particular day, the peddler isn't able to sell any of his caps, and decided to walk out to country and take a rest. While he is reading a few monkeys decide to have fun! The peddler wakes up, and quickly becomes angry with the monkeys... how the monkeys respond is sure to bring giggles from kids of all ages! There is nothing like a bunch of monkeys acting like silly monkeys. My kids love to hear this story because of the silly "monkey business" that add so much to this classic. Not to mention, this is a story that I heard as a child, so there are great memories there. I also enjoy this story because for my youngest littles, the behavior of the peddler as he gets angry with the monkeys helps to illustrate the issue we often have as parent and child - have you experienced the moments when young children do not realize what they are doing is trying your patience and so it becomes a game? Then trust me, this is a story you will love! You see, the monkeys cannot talk, but they can mimic the actions of the peddler - and there in those pages of the story, cause and effect is wonderfully illustrated in a simple illustration that sets a wonderful foundation of comprehension for young readers and story listeners. The books also has patterns, repetition, sequencing and colors just in case you are working on these concepts with your kiddos. While the ages for this book are officially for preschoolers and up, even my toddlers enjoy this one. My biggest suggestion for moving your toddlers from simple picture books to these longer stories is to start with just reading a sentence or two each page, but spend a few minutes on each page pointing to different parts of the illustrations. This book has a page at each spread with a large scene that you can point to and discuss. By spending the time on each page, even if you are not reading the actual story, you child will develop a longer attention span for the book. You will be able to add a sentence to each page every time you read it - and before you know it your child will have an attention span for other classics like The Velveteen Rabbit! Did you want Reading Rainbow when it was on TV? Do you show reruns to your kids now? Did you have a favorite Reading Rainbow story?